I’ve been making special birthday cards for my kids since their first birthdays. My daughter Ashleigh turned 16 recently. She’s horse mad, so naturally this year’s theme had to be horses again! The horses at Larkrigg near Kendal get spoiled rotten when Ashleigh is around, so you’ll understand what’s going on in this year’s card. I think Ashleigh spoils the horses at Larkrigg. 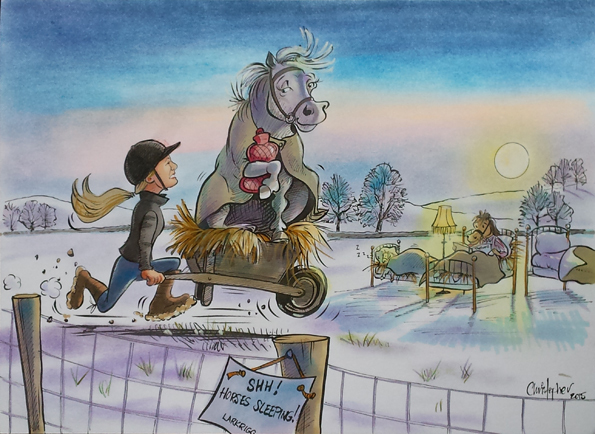 This entry was posted in Caricatures from photos and tagged caricature, cartoon, horse on February 24, 2015 by Christopher Murphy Studio. What do you get for someone who’s retiring? 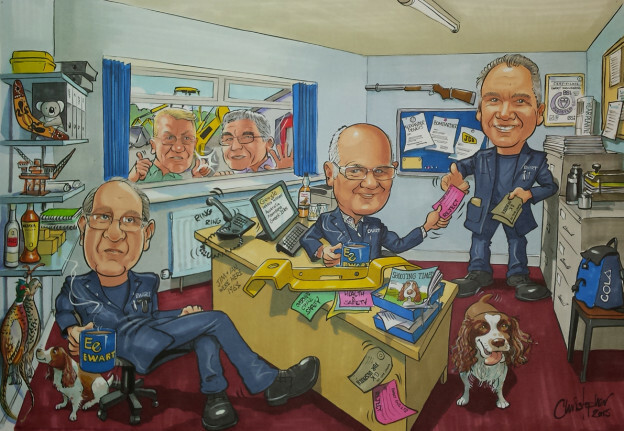 For this customer it could only be another caricature by Chris Murphy. It shows the gentleman who was retiring centre stage with his work colleagues around him. This entry was posted in Caricatures from photos on February 19, 2015 by Christopher Murphy Studio. A caricature ordered for valentines day. Party time at the Monaco Grand Prix 2014. This was drawn on A1. 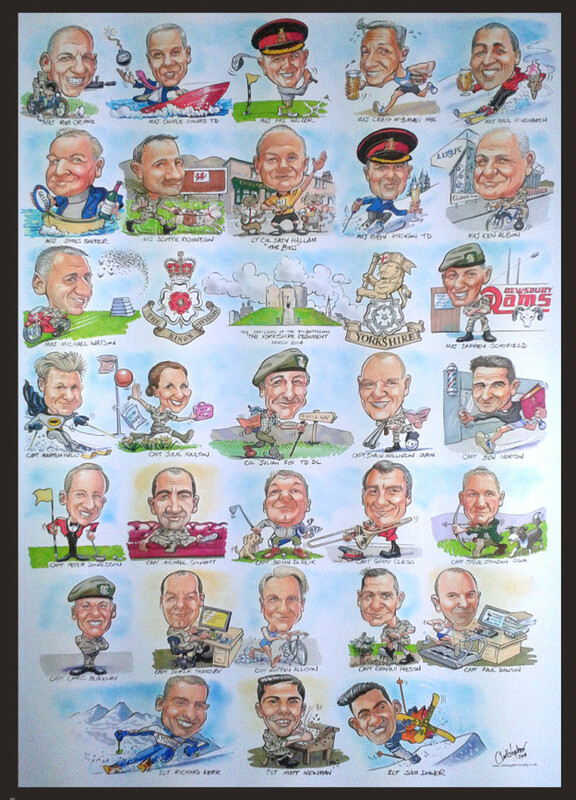 It was great fun to do and probably the most complex one I’ve done to date. 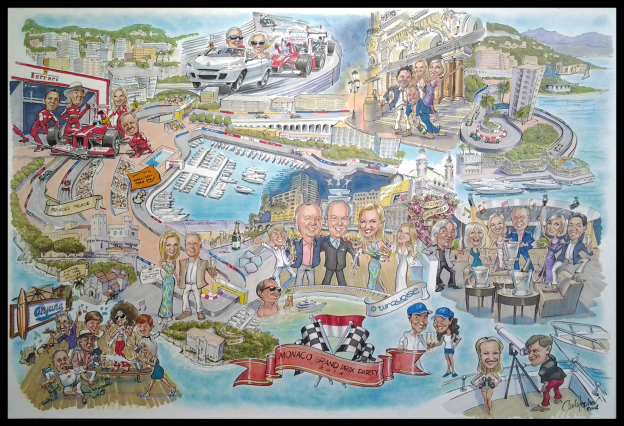 This entry was posted in Caricatures from photos and tagged Group caricature, Monaco Grand Prix on October 16, 2014 by Christopher Murphy Studio. This entry was posted in Caricatures from photos and tagged Army, group, officers on June 25, 2014 by Christopher Murphy Studio.